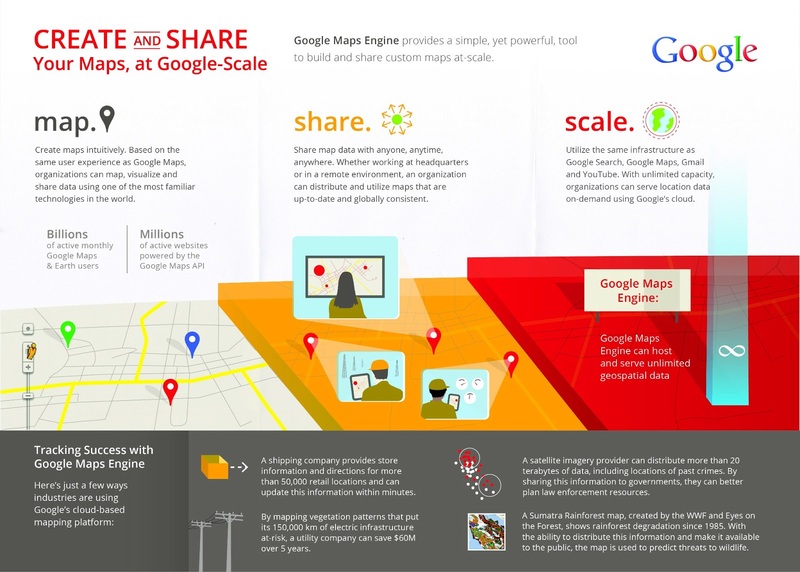 Check out this great infographic we found on the Google Enterprise Blog detailing how Google Maps Engine can transform the way enterprise organizations create and share customized maps! Google Maps is one of the most familiar user interfaces in the world with reports of over 54% of users running the mobile application between April-June 2013 alone. Google Maps Engine gives organizations the ability to take their data and layer it on top of a Google Map to create a customized Google Map to share with employees, clients or the general public. Sharing maps has never been easier – with Google Maps Engine, you can publish maps internally or externally at the push of a button. Google Maps Engine API provides direct access to Maps Engine, allowing organizations to edit and read spatial data hosted in the cloud, or develop on any platform – whether that’s web, Android, iOS or server-to-server. Organizations can quickly build out applications like store locators or crisis-response maps. To learn more about our Google Maps Engine services, get in contact with our geospatial team!